The Frigidaire Gallery 30-inch Smudge proof Stainless Steel Slide-In Gas Range offers more cooking flexibility with a 4.5 cu. ft. oven and a four sealed gas burner cooktop that features a 17,000 BTU Power Plus burner and 15,000 BTU Quick Boil burners. The large 4.5 cu. ft. capacity oven has true convection, which features a 350 Watt element that surrounds the convection fan to distribute heat throughout the oven for faster baking and roasting. With Quick Preheat, which preheats in less than six minutes, and a storage drawer that provides extra room for your pots and pans. GE Free Standing Ranges can be installed free from surrounding cabinetry. The side panels have a finished appearance. GE's TrueTemp System "manages" oven temperatures to ensure accurate, consistent heating and total cooking performance. The SmartLogic electronic control, with platinum sensor, constantly monitors the oven's performance to ensure more precise temperature management. It features Sealed Cooktop Burner that helps contain spills from dripping beneath cooktop for easy clean-up. Sealed gas burner controls let you adjust flame height for various cooking needs. Also offers Steam Clean feature where you can fill the reservoir with water and set your oven to "Steam Clean". After 30 minutes you're able to wipe clean all grime and residue. GE Free-Standing Ranges can be installed free from surrounding cabinetry thanks to their side panels offering a finished appearance. Included on this 30-inch Self-Cleaning Gas Range is the TrueTemp system that manages oven temperatures to ensure accurate, consistent heating and total cooking performance. It also features SmartLogic electronic controls with platinum sensor that constantly monitors the oven's performance to ensure more precise temperature management. Plus, the sealed gas burner controls let you adjust flame height for various cooking needs. And the Steam Clean option allows you to fill the reservoir with water and clean the machine in just 30 minutes, without any harsh chemicals. For that premium appearance, this GE Profile slide-in gas convection range in black slate completes the look. It has edge-to-edge interlocking grates for a large continuous cooking surface and an integrated reversible cast iron grill/griddle. It has built-in Wifi connectivity for control at your fingertips and a 21,000 BTU tri-ring burner perfect for searing, frying and sautiing. Handle any cooking task with this 30-inch GE Profile gas range. Its double convection ovens provide efficiency and faster preheating for everyday cooking and for preparing large dishes, and its cooktop has a reversible grill and griddle for added versatility. 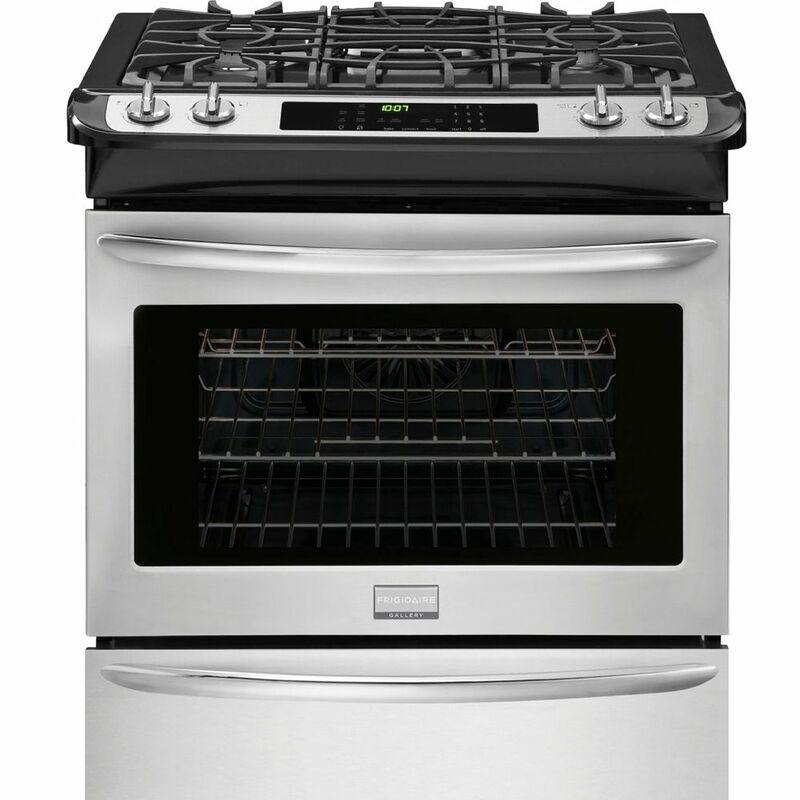 Simmer delicate dishes with the 5,000 BTU burner of this GE Profile gas range. WiFi Connected Ranges allow you to control your oven wherever you are. 4.2 cu. ft. 30-inch Self-Cleaning Free-Standing Gas Range in Smudge proof Stainless Steel The Frigidaire Gallery 30-inch Smudge proof Stainless Steel Slide-In Gas Range offers more cooking flexibility with a 4.5 cu. ft. oven and a four sealed gas burner cooktop that features a 17,000 BTU Power Plus burner and 15,000 BTU Quick Boil burners. The large 4.5 cu. ft. capacity oven has true convection, which features a 350 Watt element that surrounds the convection fan to distribute heat throughout the oven for faster baking and roasting. With Quick Preheat, which preheats in less than six minutes, and a storage drawer that provides extra room for your pots and pans. 4.2 cu. ft. 30-inch Self-Cleaning Free-Standing Gas Range in Smudge proof Stainless Steel is rated 4.3 out of 5 by 198. Rated 1 out of 5 by Dltb from Hate the noisy fan I bought this in November. The cooling fan that runs continually while the oven is very noisy. I’ve had it looked at and have been told that is just the way it is. Very bad design flaw. Wish I had not bought this stove. FGGS3065PF has about 2-inch gap on the back and the wall but I did not see any filler panel included in the box. Does anyone know if it is supposed to come one with the purchased item or it is something we need to buy from the market separately?